first brushes which are distinguished not only for the originality but also for their therapeutic support. All components and materials with which they were made ​​are carefully selected and among the most valuable. Dawa Creative Brushes Brushes CLEAR Mechanical Stress enemy of the hair which is normally the cause of hair breakage during brushing. 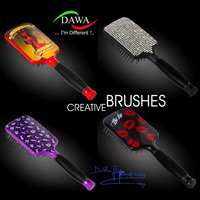 Dawa Creative Brushes bring in electrostatic equilibrium is a hair more shine.